It was possibly Britain’s deadliest conflict and one which shaped our modern world. 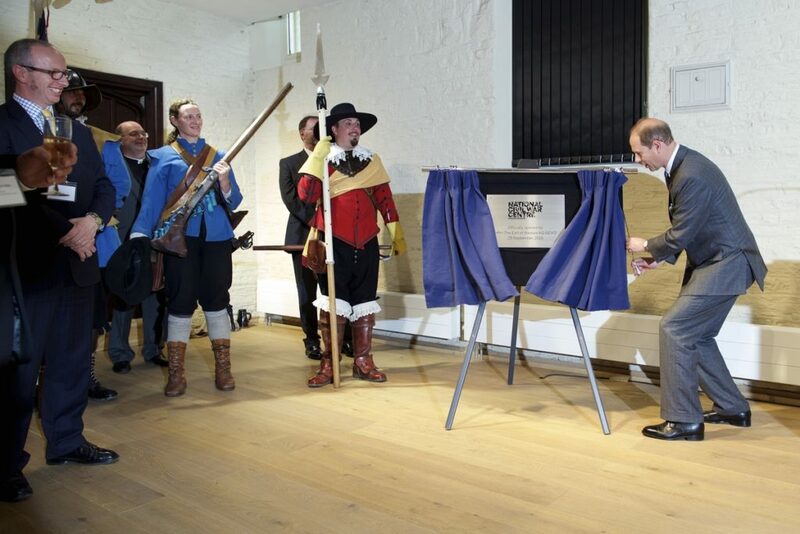 Today (Friday 25 September) HRH The Earl of Wessex officially opened the UK’s first ever visitor attraction dedicated to telling the epic story of the 17th century British Civil Wars. The National Civil War Centre in Newark is a flagship £5.4m project by Newark and Sherwood District Council supported by £3.5m from the Heritage Lottery Fund and delivered by local building conservation specialists Woodhead Heritage of Nottinghamshire. Before unveiling a plaque to mark the occasion, HRH The Earl of Wessex toured the exhibition galleries housed in the restored Grade II* Old Magnus Building, which began life as a Tudor grammar school, and met key figures involved in the scheme. He was also able to glimpse 400 year old graffiti penned by naughty school boys in the Tudor attic – preserved as part of the project – and handled a priceless golden Iron Age necklace, found nearby by a local metal detectorist and now returned to Newark from the British Museum. The Prince also logged on to an augmented reality National Civil War Trail app by holding up a tablet at a portrait of King Charles I and listen to the ill-fated monarch asking his people to stand with him and fight the “Parliamentarian rabble”. This fresh and exciting approach to story telling is make history more accessible than ever to a new audience. The National Civil War Centre, on Appletongate, is open daily from 10am to 5pm.